There are those who paint just for fun and those who make painting a career. Susan Scheewe, who has been painting since five years old, does both. Since Susan received her degree in Fine Arts, she has been teaching for over 35 years and encouraging others to enjoy her love of painting. Susan is an artist, teacher, writer, publisher, businesswoman and television personality. She and her personally trained staff of instructors have conducted seminars in the United Sates, Canada, England, Germany, New Zealand, Japan, South Korea, and Taiwan. For more than 10 years, Susan has successfully been a host of Public Television programming. Her genuinely warm and welcoming style combined with her easy-to-master techniques, continue to nurture an ever-growing audience of viewers and painters. 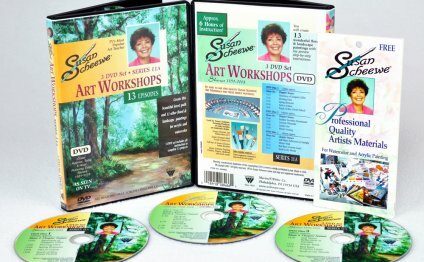 Susan is committed to creating new and exciting episodes of the Scheewe Art Workshop for years to come. Currently, in its 12th season the Scheewe Art Workshop is viewed in over 20 Countries. The availability of hands-on workshops, combined with her instructional books, DVDs and television program assures the success of every artist, even the beginner. Whether painting along, or simply watching her paint, Susan’s program offers viewers the opportunity to share the adventure and pleasure of painting. Susan travels the world over, teaching as well making guest appearances on foreign television programs. But her favorite place is her home in Oregon, where she gets her inspiration and enjoys life with her husband and family. Susan has two talented and beautiful grown daughters, two sons-in law, and two grandchildren, whom she adores.